Eighteen academic and administrative leaders at Vanderbilt University have been elected fellows of the American Association for the Advancement of Science (AAAS) this year. The new fellows will be recognized on Feb. 15 at the 2014 AAAS annual meeting in Chicago. Vanderbilt University now has 94 AAAS fellows among its current and emeritus faculty and staff. Half – 47 — have been elected during the last three years, reflecting remarkable momentum and growth of the University’s academic reputation. Christopher Aiken, Ph.D., professor of Pathology, Microbiology & Immunology, for distinguished contributions to virology, particularly in elucidating the biochemical structure and molecular mechanisms for the role of the capsid structure of HIV-1 infection. Carlos Arteaga, M.D., the Donna S. Hall Professor of Breast Cancer, and professor of Medicine and Cancer Biology, for research that provided the role for several growth factors and receptors in the pathogenesis of breast cancer, and the rationale for new targeted cancer therapies. Daniel Beauchamp, M.D., the John Clinton Foshee Distinguished Professor of Surgery, professor of Cancer Biology and of Cell & Developmental Biology, and chair of the Section of Surgical Sciences, for distinguished contributions to understanding gastrointestinal growth control and neoplasia, and exemplary leadership in academic surgery nationally, and for fostering team science at Vanderbilt. Paul Bock, Ph.D., professor of Pathology, Microbiology & Immunology, and of Medicine, for distinguished contributions to understanding the action of proteases, particularly the critical protease cascades that mediate blood coagulation. Alan Brash, Ph.D., professor of Pharmacology, as one of the world’s leading authorities in the field of the biosynthesis of prostaglandins and related eicosanoids. Alan Cherrington, Ph.D., the Jacquelyn A. Turner and Dr. Dorothy J. Turner Professor of Diabetes Research, professor of Molecular Physiology & Biophysics and of Medicine, for distinguished contributions to understanding carbohydrate metabolism and metabolic disorders, especially the action of hormones and neural mediators on the liver. Timothy Cover, M.D., professor of Medicine and of Pathology, Microbiology & Immunology, for distinguished contributions to the fields of medicine and microbiology, particularly for investigating molecular mechanisms by which Helicobacter pylori contributes to gastric disease. Walter Frontera, M.D., Ph.D., professor and chair of Physical Medicine & Rehabilitation, for distinguished contributions to the field of skeletal muscle physiology, particularly mechanisms underlying muscle weakness and sarcopenia in the elderly. James Goldenring, M.D., Ph.D. , the Paul W. Sanger Professor of Experimental Surgery, professor of Surgery and of Cell & Developmental Biology, for distinguished contributions to epithelial biology including Rab protein regulation of apical membrane recycling, and the origin of pre-cancerous metaplasia from transdifferentiation of chief cells. MacRae Linton, M.D., the Dr. Stephen Schillig Jr. and Mary Schillig Professor of Medicine, and professor of Pharmacology, for development of novel methodologies that have elucidated the role of the macrophage in atherosclerosis. Mark Magnuson, M.D., the Louise B. McGavock Professor, professor of Molecular Physiology & Biophysics, Cell & Developmental Biology and Medicine, for distinguished contributions to understanding mammalian glucose homeostasis, and pancreatic beta cell development and function, and for international leadership in developing strategies for novel engineered mouse models of disease. David Miller, Ph.D., professor of Cell & Developmental Biology and of Biological Science, for distinguished contributions to the field of developmental neurobiology, particularly molecular genetic models of synaptic specificity and dendrite morphogenesis. Paul Newhouse, M.D., the Jim Turner Professor of Cognitive Disorders and professor of Psychiatry, Medicine and Pharmacology, for distinguished contributions to understanding human cognition and changes in cognitive function induced by drug treatments in normal aging and disease states. James Patton, Ph.D., Stevenson Professor of Biological Sciences, for distinguished contributions to the field of RNA biology and for leadership in graduate education. David Robertson, M.D., the Elton Yates Professor of Autonomic Disorders, and professor of Medicine, Neurology and Pharmacology, , for distinguished contributions to cardiovascular medicine, particularly studies of the autonomic nervous system, mechanisms of autonomic dysfunction, and identifying novel treatment of autonomic disorders. David Salisbury, senior research writer at Vanderbilt, for distinguished contributions as a communicator, first as an award-winning journalist and subsequently as a multimedia pioneer in university science communications. Samuel Santoro, M.D., Ph.D., the Dorothy Beryl and Theodore R. Austin Professor of Pathology, professor and chair of Pathology, Microbiology & Immunology, and professor of Biochemistry, for groundbreaking contributions to understanding how cells interact with the extracellular matrix, and for leadership in biomedical education, academic administration and service. Anthony Weil, Ph.D., professor of Molecular Physiology & Biophysics, for distinguished contributions to the field of eukaryotic gene transcription control, particularly development and characterization of soluble, cell-free transcription systems and transcription mechanisms. 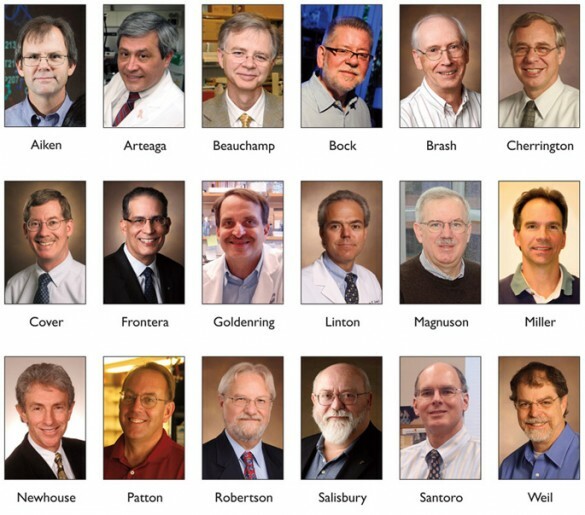 For more information on AAAS Fellows, see http://www.aaas.org/aboutaaas/fellows/.